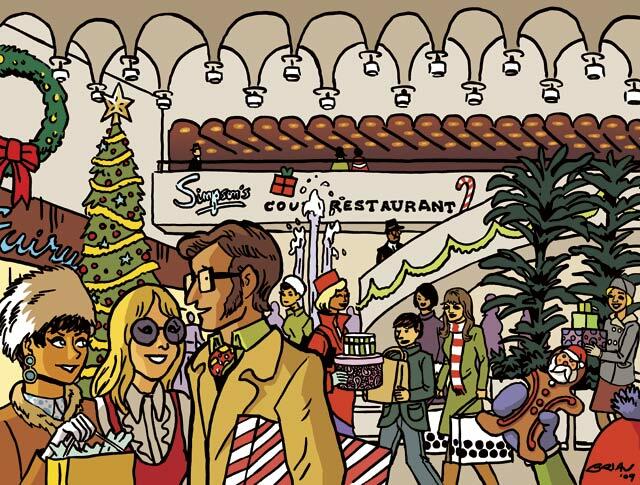 Holiday shopping at Yorkdale in the 1960s. Illustration by Brian McLachlan/Torontoist. Christmas shopping is upon us, which means it’s time for the claustrophobic to avoid approaching most of Toronto’s shopping malls. Yorkdale will be one of the busiest spots, as drivers try their best to avoid getting into a fender-bender with the twenty-seven other drivers fighting for a precious parking spot. The same scene probably played itself out when the mall opened forty-five years ago as an attempt to bring the diversity of downtown shopping to the suburbs, complete with modern conveniences, even if the mall no longer contains tenants like five-and-dime chains, display space for bathroom fixture manufacturers, or grocery stores. Once upon a time, a millionaire from British Columbia decided that he would like to buy some land north of Toronto to run a sleepy farm. Barrett Montfort purchased most of the property where Yorkdale sits in 1942 and claimed he never saw a development boom coming. “It just never occurred to me that something like Highway 401 would ever be built there. It was just an old farm when I bought it. It had been a good farm for many years.” By the mid-1950s, Eaton’s rented his property with an option to buy as the department store eyed potential sites for a suburban development. Corporate officials saw that Montfort’s land sat at a future transportation crossroads, thanks to a proposed extension of Spadina Road on the east side. 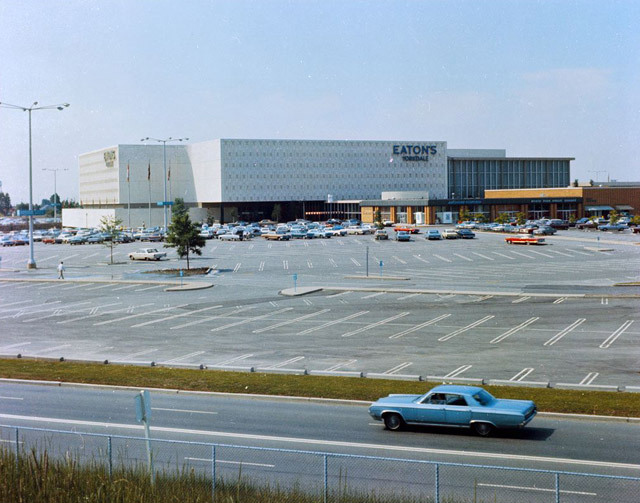 Exterior of Eaton’s Yorkdale, circa 1965. City of Toronto Archives, Fonds 217, Series 249, File 199, Item 1. 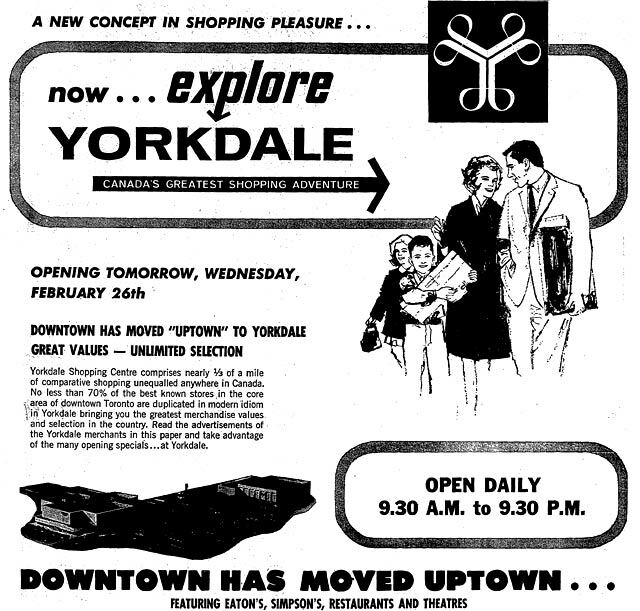 After four years of planning, Yorkdale was unveiled to the public at a press conference held at the Granite Club on October 16, 1958. Officials from Eaton’s and rival department store Simpson’s announced that the two companies were ready to open locations in the same shopping complex for the first time, in order to provide consumers “with the best suburban shopping facilities to be found anywhere in Canada.” Besides land acquired from Montfort, the development team also purchased property held for future use by General Motors to assemble enough space to build a twenty-five-million-dollar, sixty-two-store plaza. The court in front of Simpson’s, circa 1965. City of Toronto Archives, Fonds 217, Series 249, File 198, Item 1. North York officials hoped that Yorkdale would speed up the arrival of the Spadina Expressway, though the controversial road briefly proved an obstacle. Just as the preliminary architectural and engineering studies wound down in 1960, an offhand conversation with an official from the Ontario Department of Highways revealed that expansion plans for Highway 401 coupled with a massive interchange with Spadina would not include any direct access to the plaza. To add insult, the developers would also have to sacrifice a few acres for the good of Metro drivers. After negotiation, access was secured and the site studies were renewed. The opportunity for classy shopping couldn’t come fast enough for nearby residents during the excavation phase. Complaints were made to the township in July 1962 about dust clouds that forced residents to close their windows on hot summer days and thwarted attempts to hang laundry. Contractors were charged with anti-noise bylaw violations for operating trucks at all hours. Construction company representatives tried to assure residents that if work was allowed to continue twenty-four hours a day, the pain would be over in a month. This plea must have worked, as we found no evidence of a “Stop Yorkdale” campaign in the papers. Advertisement, the Telegram, February 25, 1964. The imminent arrival of Yorkdale and construction of the Spadina Expressway left the TTC in a tizzy. As the 1960s began, transit officials were always assured that the Spadina and its accompanying subway line down the middle were fifteen to twenty years away from reality. The TTC was unprepared to lay track along Spadina anytime soon and proposed to run an express bus service until demand warranted the subway. 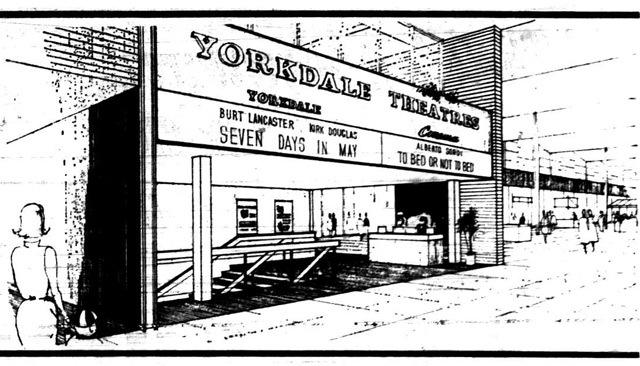 A 1963 plan called for the future subway platforms between Lawrence Avenue and Highway 401 to be built initially as bus depots, but this failed to materialize by the time Yorkdale was ready to welcome customers. Opening-day patrons without cars would find themselves crammed onto the Dufferin bus, which stopped in the parking lot every fifteen minutes. During the first year of construction, other anchors were announced. Dominion announced plans for a “jet-age” supermarket located where Holt Renfrew now sits. Shoppers wouldn’t have to worry about lugging groceries around the rest of the mall thanks to an underground pickup station where orders sent down via conveyor belt could sit for several hours. Other services included an in-store deluxe microwave oven to cook roasts and other large slabs of meat on demand and a fish counter with “such delicacies as freshly caught West Coast salmon, oysters, Alaska crab and Arctic char flown to Toronto by jet aircraft.” Other food vendors were encourage to set up kiosks in a “food bazaar” in front of the store that planners insisted would bring a touch of the Middle Eastern shopping experience to North York, even if the products were as exotic as meat from local delis. The opening bill at the twin cinemas. The Telegram, February 25, 1964. As opening day neared, Eaton’s added the final touches to its store, including one of the first automated entrances in Toronto, which was billed as an “air curtain.” Ontario College of Art student Suzan Fawcett was commissioned to create two “think pieces” out of metal to place in the foyer. As architect Elmore Hankinson noted, “We wanted to express our faith in our young, local artists. Canadian artists need encouragement but too often it comes after they have gained a reputation.” One of Fawcett’s works, Aurora Borealis Opus No. 1, was quickly dubbed “the harp” by construction workers for its arrangement of metal rods. Advertisment, the Toronto Star, February 26, 1964. 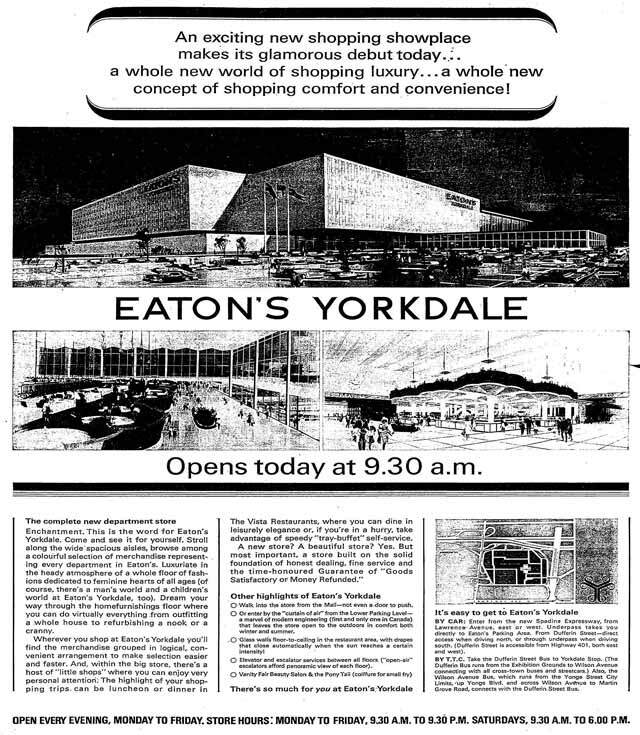 The Telegram sent two shoppers on a preview of Yorkdale. They were awestruck. “I’ve never seen so many stores in my life. It’s just like a city in itself,” said Marion Clancy. “It’s just as bright as being outdoors, but it’s far nicer. You don’t get your hair blown around.” The rest of the public had their first opportunity to check out the mall at 9:30 a.m. on February 26, 1964. Over one hundred thousand shoppers were estimated to have passed through that day, which created a scene that compared to the CNE midway. Barber John Folino later recalled that many of those wandering through “were all dressed up like they were going to church.” The official ribbon cutting took place at noon, followed by a lobster and cocktail lunch for VIPs. Plebeians made do with freebies from banks and stores, along with reduced prices on meals like the roast turkey special at Kresge’s one-hundredth Canadian location—for the princely sum of sixty cents diners received “savoury dressing, cranberry sauce, cream whipped potatoes, giblet gravy, buttered green peas, roll and butter” with their fowl. The parade of people heading into “the instant downtown uptown” for opening day required fourteen police officers to direct traffic, though the traffic jam was nowhere near as bad as Yorkdale’s first Saturday of business a few days later. Maybe it had something to do with falling on Leap Day, as drivers found themselves in a jam running three miles on either side of Dufferin Street. All 6,500 parking spots were filled by 11 a.m. and police took two hours just to find an appropriate overflow location. Poorly marked underpasses didn’t help the situation. 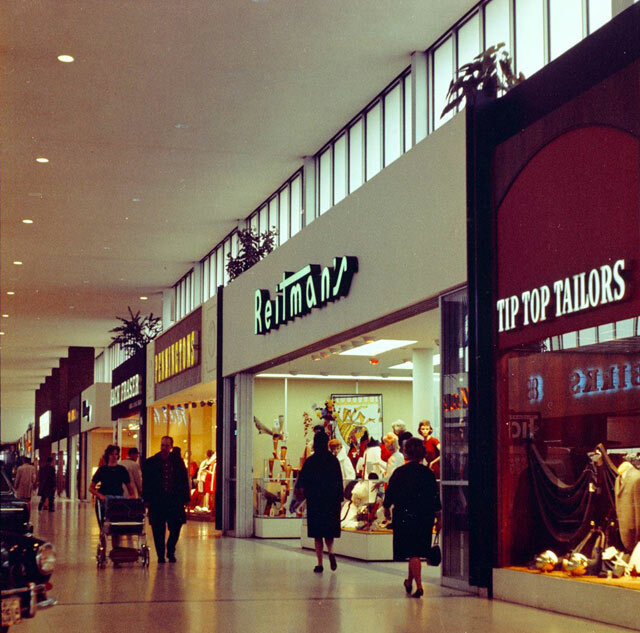 A sampling of stores at Yorkdale, circa 1965. City of Toronto Archives, Fonds 217, Series 249, File 197, Item 1. None of these views deterred shoppers, with more stores open and sales looking rosy as the 1964 Christmas season approached. Nearby shopping centres definitely felt an impact, with Lawrence Plaza reporting a 25% drop in sales since Yorkdale opened. 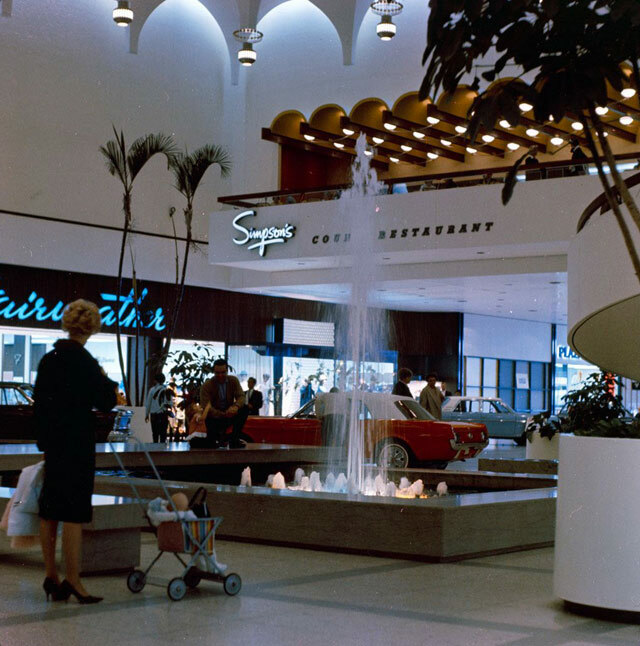 Shoppers enjoyed the wide walkways of what for a short time was the world’s largest shopping centre until the expansion of Honolulu’s Ala Moana in 1966. Additional material from the June 1964 issue of Canadian Architect; the October 17, 1958, May 31, 1962, December 15, 1964, and February 21, 2004 editions of the Globe and Mail; the February 25, 1964 and February 26, 1964 editions of the Telegram; and the October 17, 1958, June 3, 1960, May 31, 1962, July 10, 1962, November 24, 1962, April 3, 1963, February 21, 1964, February 25, 1964, February 27, 1964, and March 2, 1964 editions of the Toronto Star. CORRECTION: November 18, 5 p.m. The original post misspelled Suzan Fawcett’s name. We regret the error.